This is the program you should give to your interactive users. With it, they can choose a language to use for the programs of your software package they have access to. The languages listed are read from the file E$LNGDT2, which should be available to all users of your software. 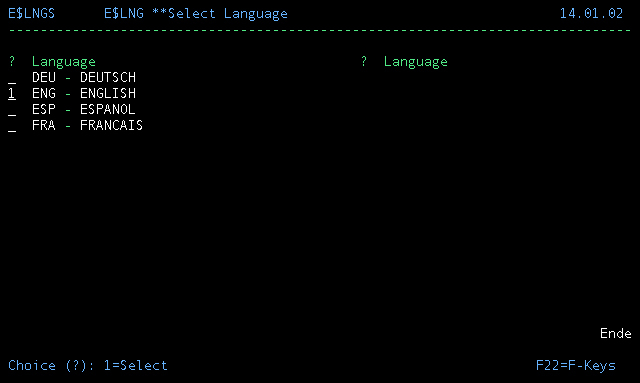 When a user chooses a language, the program alters the library list so that the Language Library belonging to the chosen language is above the default Language Library. It will be POSITION(*AFTER QTEMP), assuming QTEMP is always at the top of the library list. If you use a self written menu program, you should immediately update the screen to reflect the change of the active language. Use this option to select a language. Only the first record with a 1 is taken when multiple are selected.